After more than a year of fighting and abuse accusations between guards and inmates, both sides came together Friday to break bread. 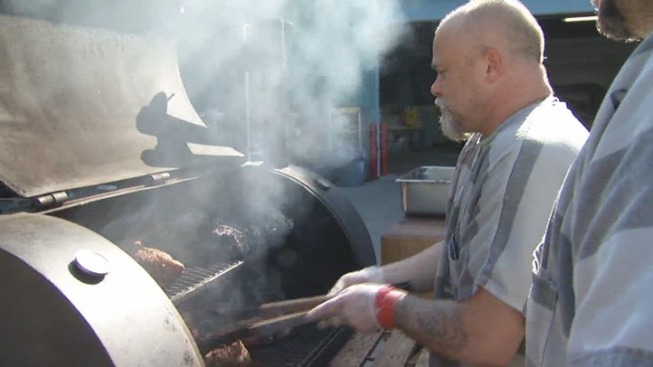 The guards at Elmwood Jail in Milpitas barbecued for inmates as a thank you for their help during a project that benefits children in Santa Clara County. A couple dozen inmates at the jail helped build an obstacle course for what's called the Hero Run, a benefit for the pediatric unit of Valley Medical Center. The inmates said things are different now between them and the guards. "This is excellent. We're stoked," inmate Dennis Bohle said of the barbecue event. "My partner and I were helping cook and we're drooling. Can't wait. We're excited." The small party was enough for the Santa Clara County Sheriff Laurie Smith to stop by and witness the camaraderie between inmates, guards and deputies. "Thank you so much for everying," Smith told the jail staff and inmates. Relations between guards and inmates have been strained even before the beating death of inmate Michael Tyree in August 2015. Three guards are now facing murder charges in that case. Inmates on Friday said it seems things are turning around. "Things have changed over the year," inmate Lonnie Nunley said. "A lot for the good." Bohle said jail guards are now more understanding. "We've been working on it," Smith said of the improved relationship. "Our reforms have been in place for a long time, even before we had the death in the jail."